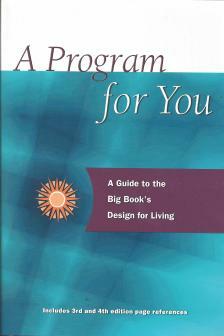 A Program for You: A Guide to the Big Book's Design for Living clears our way for discovering positive, powerful answers to these questions. In the years since 1939, the Big Book, Alcoholics Anonymous, has guided millions in their search for a design for healthy living free of addictive behaviors. Now, two program old-timers share their years of intensive study of the Big Book, revealing the vitality of its message for those of us reading it today. This celebration of the basic text of Twelve Step recovery breathes new life into the Big Book's timeless wisdom. Thoroughly annotated line and page, written with down-to-earth humor and simplicity, and providing a contemporary context for understanding, A Program for You helps us experience the same path of renewal that Bill W. and the first on hundred A.A. members did. A Program for You leads each of us--newcomer or old-timer--to a deeper understanding of recovery as a way of life. As the authors tell us, "The better you understand the Big Book, the more it can help you."